Here is the last in a series of three drawings of my dear friend Hazel. 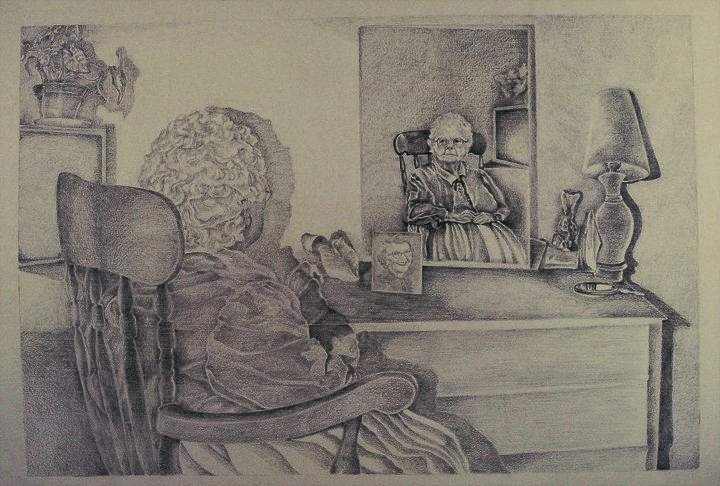 It is based on the subject of reflection and in this portrayal we see the clarity in her mirrored image. At this point in her life, she was in the nursing home and her surroundings had been diminished to a few pieces of furniture in a small room. The once gracious hostess and teacher never lost her dignity and was always inviting and warm. I hope to be able to possess such strength and wisdom. You are currently reading Hazel in the Mirror at Dr. Mary McNaughton and Drawing.